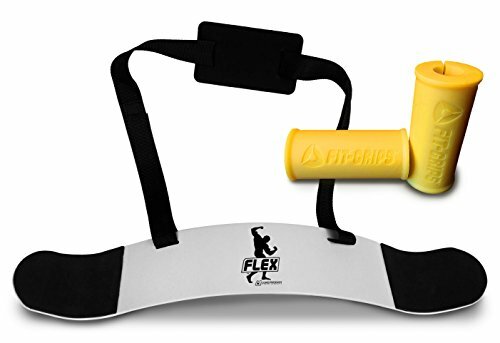 Flex Premium Arm Blaster + Fit Grips - Arm Blaster Support Plus Thick/Fat Bar Training. Try contracting just your bicep with an open hand. Then contract your bicep plus your forearm with a closed fist. You will notice a much stronger contraction in your bicep when your entire arm is contracted. This is called muscle irradiation. The basic principle of irradiation states that the harder a muscle contracts, the harder the surrounding muscle contracts. This is the principle behind the movement to thicker training bars. If your hand is contracting more because the bar is thicker and awkward to control, the entire muscle group activated by the exercise will be more engaged. In the early days of bodybuilding, thick handle barbells were more common with 2" plus outside diameters. Today, most gyms and training centers are equipped with barbells and dumbbells with 1" handles. However, there is a resurgence in thick handle training equipment because trainers, athletes, bodybuilders and recreational lifters are re-discovering the significant benefits when these products are used. Core Prodigy is now offering our version of thick training grips called Fit Grips 2.0 (2.0" Outside Diameter with a 1" inside diameter). Fits most barbells. We guarantee you will be 100% satisfied with this product. The Flex Premium Arm Blaster is 24" long x 3.5" wide with a 3.75" arch peak and made of a thick gauge aluminum. The Flex Premium Arm Blaster perfectly supports your elbows and enables you to keep the correct posture during curls. Users immediately notice proper bicep isolation when curling with the Flex Premium Arm Blaster. Max weight supported 135 lbs. If you have any questions about this product by Core Prodigy, contact us by completing and submitting the form below. If you are looking for a specif part number, please include it with your message.